January 21, 2016 January 21, 2016 / Elizabeth T.
Hello loves, and Happy Thursday! Haha but in reality, age is just a number because what really matters is your mindset about things, your perspective about life, and your outlook of the future. This past year has been full of so many ups and downs, and honestly 23 was a challenging yet very enlightening year. Though it was hard, I’m proud of what I’ve achieved so far, and I also feel so lucky to be blessed with the most amazing people in my life who’ve helped me, supported me, and encouraged me throughout everything. I hope 24 will be an amazing year, where I’ll learn even more, not only about the world, but about myself as well. This year, I’m just going to be doing a quiet dinner with some of my closest friends and family, so a comfortable yet cute outfit will be perfect for the occasion. I opted for one of my newest sweaters, an ivory v-neck knit with a slightly tribal, bohemian pattern, paired with a maroon skater skirt for a pretty yet cozy ensemble. Since it’s still winter, I threw on my favorite fleece tights and finished the look with the comfiest pair of shoes in my wardrobe – my UGG classic boots (it literally feels like I’m walking on a cloud hahaha)! 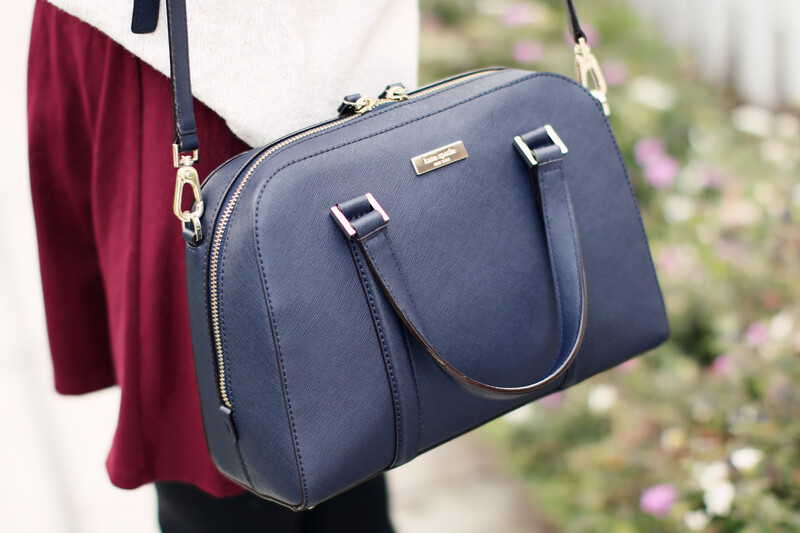 And of course, I can’t forget my newest favorite navy blue Kate Spade bag too! Advanced Happy Birthday! January babies, FTW (mine was this past Sunday). Aww thank you so much love! ❤ And Happy Belated Birthday to you as well 😀 Haha January babies yesssss! Happy Birthday!!! I love the skirt! Happy Birthday! 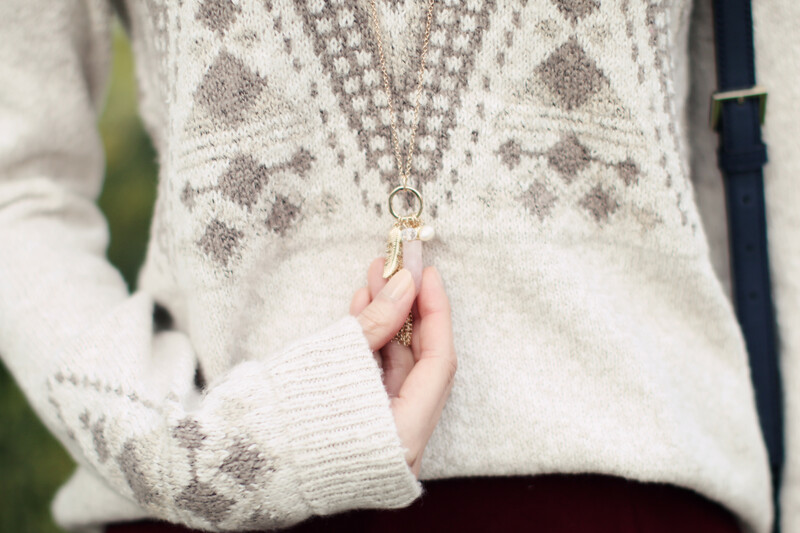 Such a cozy outfit for winter! Thank you Hannah! 🙂 ❤ Glad you liked the outfit! Thank you so much love ❤ And of course! Can't wait to check out your blog! Cute outfit! Love the style, and happy birthday! Thank you so much Alice ❤ 🙂 Glad you liked this outfit! Happy Birthday lovely! ❤ Sending you the best birthday wishes!!! And I love this super cute & comfortable outfit. Thank you so much Lynna! You’re so sweet! ❤ Hehe and I'm glad you liked this comfy/cozy outfit 🙂 Wishing you a great weekend! Congrats on another year around the sun! i hope you had an amazing birthday!! 🙂 I totally get you, its like ever since we celebrated our 20 years old bday, all of a sudden we’re almost 25 already! btw, those UGG boots look so cute on you! Hey Happy Birthday!!! You looks so beautiful dear!! You look great dear! love the red skirt! Awesome post and happy birthday! Thanks for sharing and check out our frame of the week! I think you could totally pull it off. Thank you so much love! ❤ And of course! First time on your blog and we absolutely love it! This outfit is perfect on you and perfect for winter! Thank you for the inspiration! Oh, and of course we wish you a Happy Birthday! We’re sure this new year will be amazing! Happy belated B-day my love! Very beautiful article, this is the first time i visit your blog, i like it, you are so lovely, and even if i’m late, i wich a happy birthday. I love you outfit, the skirt is lovely. Aww thank you so much Marie ❤ 🙂 You're too kind! And thank you for the birthday wishes as well! Hope you enjoy my blog! I hope you had a lovely birthday! I adore your sweater! Aww thank you so much Sophie 🙂 ❤ You're too sweet!